In May 2014, we were invited to visit a 40-acre parcel of what was formerly part of the J.B. Starkey Ranch to hear about an idea. After attending a workshop at a national land conservation conference years earlier, Laura Starkey had an idea to develop a business model that would allow her to conserve natural lands while sharing the beauty of Florida’s woods with residents and visitors – the same woods she grew up in and is dedicated to preserving. Heartwood Preserve would be a nature preserve and conservation cemetery – only the second in the state – to provide ‘green’ burial options. Natural, or ‘green,’ burial is a safe and environmentally friendly practice that allows the body to return to the soil naturally by using biodegradable materials, and avoiding vaults and toxic embalming fluids. Conservation burial takes this practice a step further by burying in a nature preserve rather than a conventional cemetery, and utilizing a portion of the burial fee to help permanently protect the natural environment. More than two years after that first walk in the woods, Heartwood Preserve is a reality. 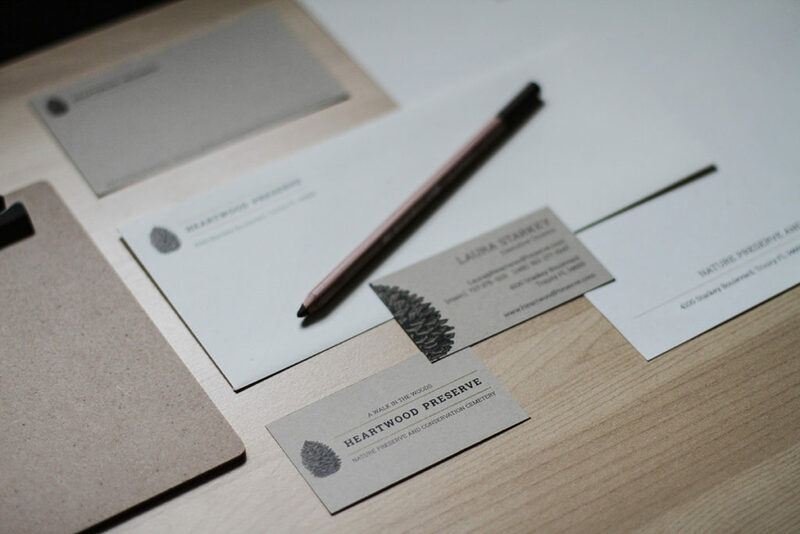 The Pinstripe Marketing team had the pleasure of working with Laura to design the brand and create marketing tools that tell the story of natural burial and illustrate the beauty of the preserve she fought to protect. The brand is, of course, inspired by nature. A hand-drawn pine cone referencing the thousands that drop from the long-leaf pines throughout the preserve serves as the iconic mark. 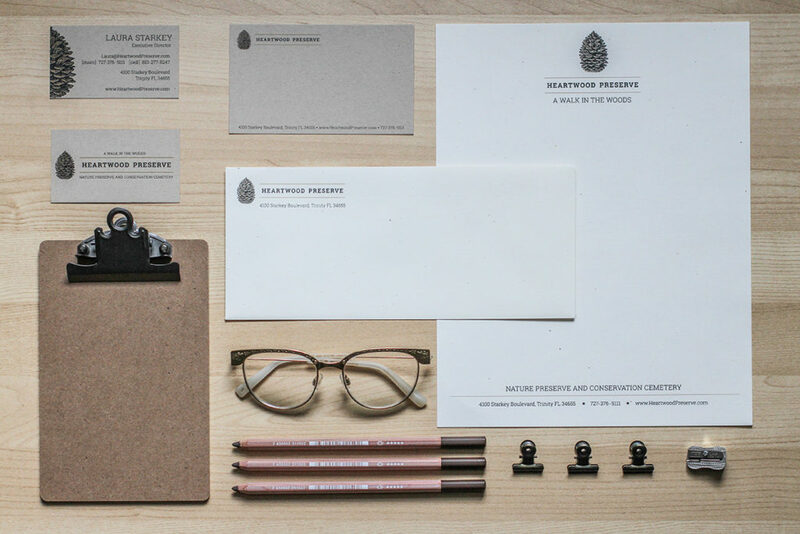 The stationery package was printed on natural, FSC Certified, Green Seal certified, 30% recycled paper (minimum). The colors and texture throughout all marketing pieces are earthy and exude the beauty of Heartwood Preserve. The web site is a source of information about natural burial and for the Florida nature preserve as an asset for the community, available for enjoying the flora and fauna. It’s also the platform to show off the beauty of the preserve. The home page video, shot by nature documentary videographer, Jennifer Brown, draws the visitor in with stunning visuals of the pine trees, palmettos, flowers, and animals who call the preserve home. The photo gallery highlights the environment and events hosted at the preserve. The site, including font selections and simple navigation, was designed with a senior audience in mind. The brochure also features a brief introduction to the preserve and photography by Andrea Ragan. 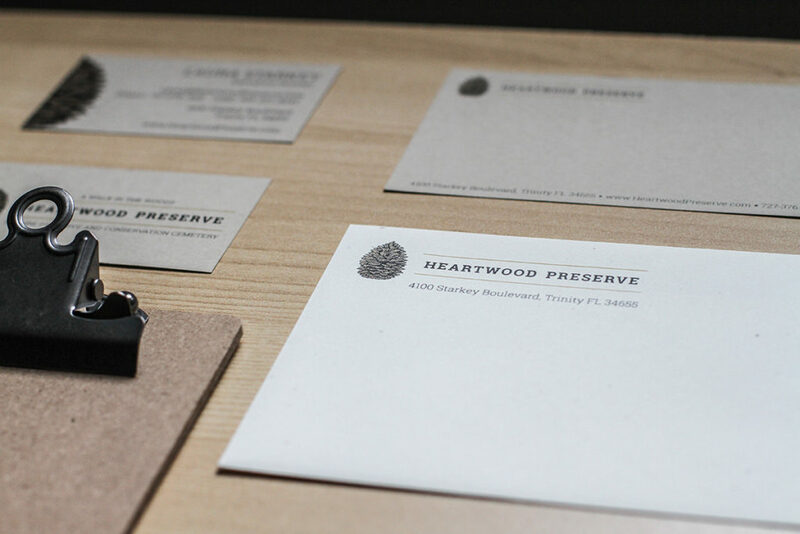 As a stand-alone piece for prospective families or as part of a comprehensive package for funeral directors, the brochure provides information about conservation burial and what loved ones can expect by selecting Heartwood Preserve as a final resting place. With all the elements for a great story, the Pinstripe public relations team is anxious to begin pitching the media about this beautiful new conservation cemetery and the Florida families who make arrangements to be buried among the long-leaf pines and palmettos. 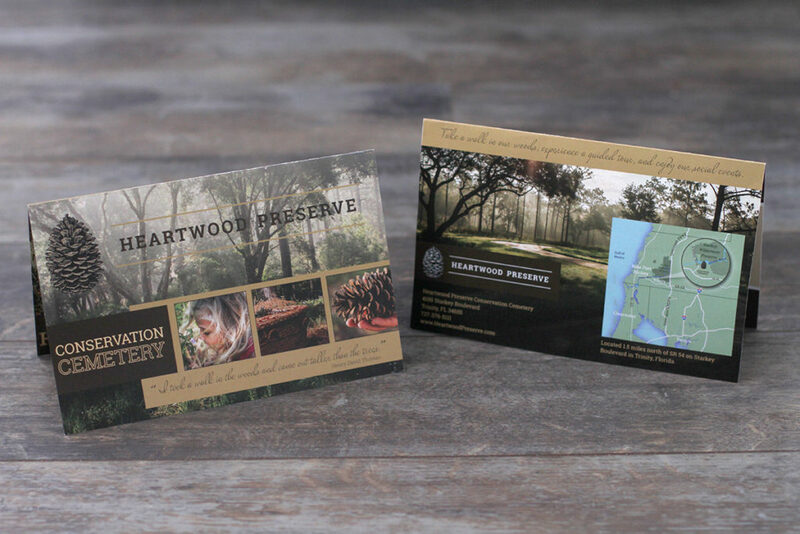 For more information about Heartwood Preserve, visit the web site or stop by for a peaceful walk in the woods. 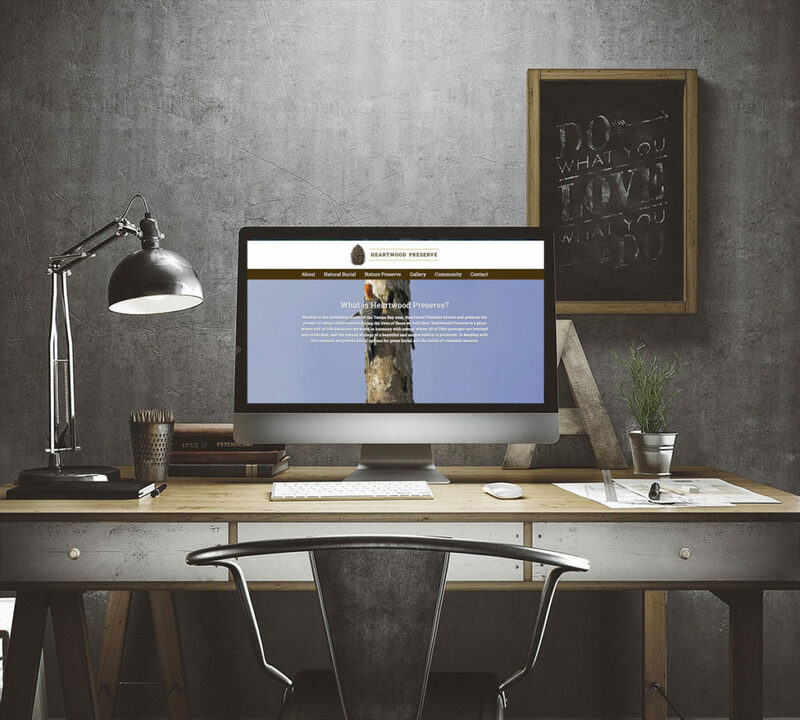 Contact a Pinstripe project manager to start developing your brand and marketing materials.